Wireless instruments can be used in locations that are difficult to access due to extreme conditions such as high temperature, pH, pressure, etc. Using wireless sensors, operators can continuously supervise processes in hazardous environments and report the data back to an operator in a monitoring facility located at a safe distance away. 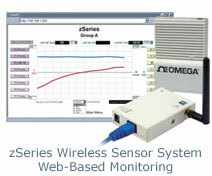 Wireless measurement is also useful for obtaining data in hard to access locations. There are a number of items to consider when selecting a wireless measurement instrument.